Marcus L Endicott: What are chatbots? And what is the chatbot community? What are chatbots? And what is the chatbot community? In the beginning, all bots on IRC (Internet Relay Chat) were popularly referred to as “chat bots”. Basically, IRC was the predecessor of IM (Instant Messaging) for realtime chat. And Facebook Messenger is basically the successor of IM. After years of IM services fighting bots and automation, in a surprise move Facebook opened Messenger to bots in April 2016, which I call the “Facebook April surprise”. Immediately, people began referring to Facebook Messenger bots as “chat bots” (note space). Until then, the term chatbots (no space) had been gradually taking over the space previously known as chatterbots. Since the Facebook April surprise, there has been a grand confusion reigning with people talking at cross-purposes about chatbots, challenging expectations all around. Basically, Facebook Messenger chatbots have become “chat apps”, with lots of graphical UI elements, such as cards, interspersed with natural language. Prior to the Facebook April surprise, there has long been a robust chatterbot community largely gathered around the controversial Loebner Prize. Until today, the Loebner Prize has been the only significant implementation of the Turing test in popular use. I happen to believe that the Turing test itself is problematic, if not a red herring; however, the contest’s founder Hugh Loebner deserves a place in history for stimulating the art, especially through the so-called AI winter. There are further stakeholders in this melee. In addition to the academic community of artificial intelligence researchers, there is also the natural language processing community. Some people count NLP as a subset of AI, though a good argument can also be made against that. My long investigation into NLP has shown to me that natural language processing has been largely predicated on the analysis, or deconstruction, of natural languages, for instance in machine translation, leading to natural language understanding. It is only relatively recently that an emphasis has been placed on the construction of natural language, generally referred to as natural language generation. Artificial intelligence itself is not a very useful term, as it implies replicating, or copying, human intelligence, which carries its own set of baggage. As used today, it is so broad as to be ineffectual. In short, AI researchers are not necessarily chatterbot, or dialog system, researchers, and nor are NLP researchers. There are various and sundry loci for high level discourse on dialog systems for the academic community, often with large corporations hanging around the periphery. There used to be a very good, informal mailing list for the Loebner Prize crew, but it suddenly got deleted in a fit of passion. From there, the chatterbot community more or less came in from the cold of perhaps a dozen separate web forums gradually to the chatbots.org “AI Zone” forum, largely dedicated to the art of hand-crafting so-called pattern-matching dialog systems, or chatterbots. Hot on the heels of the Facebook April surprise, an enterprising young man named Matt Schlicht opened the Facebook Bots (chatbot) group, which had close to 18,000 members six months later (and close to 30,000 members today, 18 months later). I would say throughout that process it has provided an informative and dynamic timeline, around which a new community has rallied. However, that same community has collectively come to realize that Facebook Messenger “chat apps” are not the chatterbots everyone has been dreaming about. Matt Schlicht had a proverbial tiger by the tail, in the form of his Facebook Bots group. Due to the public pressure of a scandal of his own making, he initiated the process of electing a moderation team in November 2016. I know how difficult this can be, managing online communities, through my own experience with the once popular travel mailing list, infotec-travel, throughout the dot-com bubble of the 1990s, an online community which ultimately lead to much of the online travel infrastructure we enjoy today. Not only have I been banned from Matt Schlicht’s Facebook Bots group, but have been banned twice, and am still banned today. The first time I was banned after posting about my chatbot consulting services. However, due to the gracious intercession of current Loebner Prize holder, Mitsuku developer Steve Worswick, my group membership was reinstated. I was then banned for the second time after sharing a private offer from Tinman Systems for their high end artificial intelligence middleware. After being ejected from the Facebook Bots group for the second time, I started my own Facebook group at Chatbot Developers Bangalore, due to my particular interest in AI, NLP, and chatbots in India. (I also happen to be co-organizer of the Bangalore Robotics Meetup.) 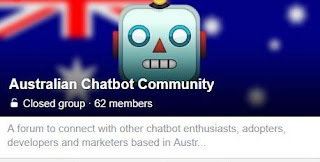 Today, I blog about this a year later, because one of those new Facebook Bots group admins stirred the controversy by requesting admission to a closed Facebook group of which I'm a member, Australian Chatbot Community. This blog post was originally submitted to VentureBeat in November 2016, prior to the successful election of a new administration team for the Facebook Bots group.